The Global Social Economy Forum (GSEF) is an international association of local governments and civil society actors dedicated to the development of the social and solidarity economy (SSE). Emerging from a first conference that took place in 2013 in Seoul and formally constituted as an international association during a second forum in Seoul in 2014, the GSEF aims to enable collaboration between local governments and the social and solidarity economy in order to support the creation of quality jobs, equitable growth, the progress of participatory democracy and sustainable development. At the moment of the constitution of the association in 2014, the members of GSEF adopted a charter that laid out its principles and its operations, including the organisation of an international forum every two years. 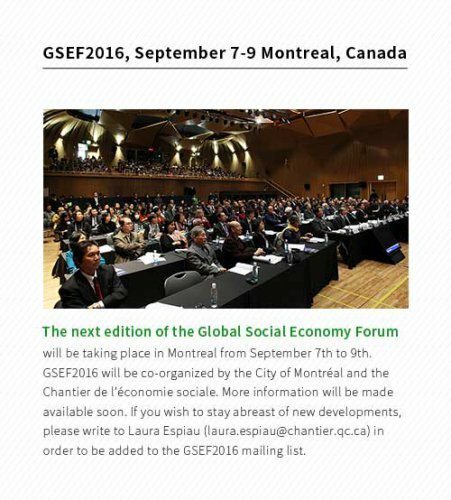 The Global Social Economy Forum - GSEF2016 will be held at the Palais des Congrès of Montreal from the 7th to the 9th September 2016. 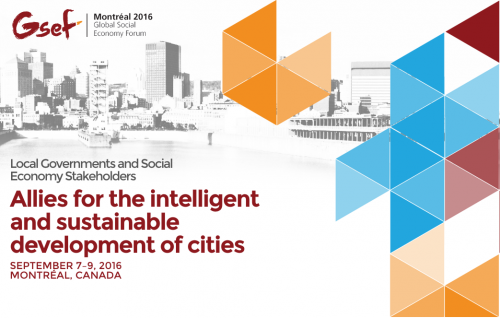 The Forum's co-organizers are the City of Montreal and the Chantier de l’économie sociale. It is expected that more than 2,000 participants from local governments, SSE organizations, the private sector and the civil society around the world will attend. The central theme of the meeting will be the collaboration between local governments and the social and solidarity economy for the development of cities. Promoting knowledge of the SSE and the recognition of its role in local development, particularly among public stakeholders, the general public and the private sector. The Forum has been conceived of as a dynamic and participatory meeting, organised in collaboration with local and international partners.